The uprising in Egypt is our theater of the possible. It is what people across the world have struggled for and their thought controllers have feared. Western commentators invariably misuse the words “we” and “us” to speak on behalf of those with power who see the rest of humanity as useful or expendable. The “we” and “us” are universal now. Tunisia came first, but the spectacle always promised to be Egyptian. As a reporter, I have felt this over the years. In Cairo’s Tahrir (Liberation) Square in 1970, the coffin of the great nationalist Gamal Abdul Nasser bobbed on an ocean of people who, under him, had glimpsed freedom. One of them, a teacher, described the disgraced past as “grown men chasing cricket balls for the British at the Cairo Club.” The parable was for all Arabs and much of the world. Three years later, the Egyptian Third Army crossed the Suez Canal and overran Israel’s fortresses in Sinai. Returning from this battlefield to Cairo, I joined a million others in Liberation Square. Their restored respect was like a presence – until the United States rearmed the Israelis and beckoned an Egyptian defeat. Thereafter, President Anwar Sadat became America’s man through the usual billion-dollar bribery and, for this, he was assassinated in 1980. 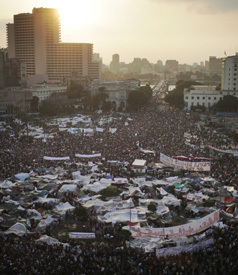 Under his successor, Hosni Mubarak, dissenters came to Liberation Square at their peril. Enriched by Washington’s bag men, Mubarak latest American-Israeli project is the building of an underground wall behind which the Palestinians of Gaza are to be imprisoned forever. The grisly Sulieman is now the peacemaker and the force for good, the man of “compromise” who will oversee the “gradual transition” and “defuse the protests.” This attempt to suffocate the Egyptian revolt will call on the fact that a substantial proportion of the population, from businessmen to journalists to petty officials, have provided its apparatus. In one sense, they reflect those in the Western liberal class who backed Obama’s “change you can believe in” and Blair’s equally bogus “political Cinemascope” (Henry Porter in the Guardian, 1995). No matter how different they appear and postulate, both groups are the domesticated backers and beneficiaries of the status quo. Fear of “Lord knows what” requires that the historical truth of American and British “diplomacy” as largely responsible for the suffering in the Middle East is suppressed or reversed. Forget the Balfour Declaration that led to the imposition of expansionist Israel. Forget secret Anglo-American sponsorship of Islamic jihadists as a “bulwark” against the democratic control of oil. Forget the overthrow of democracy in Iran and the installation of the tyrant Shah and the slaughter and destruction in Iraq. Forget the American fighter jets, cluster bombs, white phosphorous and depleted uranium that are performance tested on children in Gaza. And now, in the cause of preventing “chaos,” forget the denial of almost every basic civil liberty in Omar Sulieman’s contrite “new” regime in Cairo. The uprising in Egypt has discredited every Western media stereotype about the Arabs. The courage, determination, eloquence and grace of those in Liberation Square contrast with “our” specious fear mongering with its al-Qaeda and Iran bogeys and iron-clad assumptions, bereft of irony, of the “moral leadership of the West.” It is not surprising that the recent source of truth about the imperial abuse of the Middle East, WikiLeaks, is itself subjected to craven, petty abuse in those self-congratulating newspapers that set the limits of elite, liberal debate on both sides of the Atlantic. Perhaps they are worried. Across the world, public awareness is rising and bypassing them. In Washington and London, the regimes are fragile and barely democratic. Having long burned down societies abroad, they are now doing something similar at home, with lies and without a mandate. To their victims, the resistance in Cairo’s Liberation Square must seem an inspiration. “We won’t stop,” said the young Egyptian woman on TV, “we won’t go home.” Try kettling* a million people in the center of London, bent on civil disobedience and try imagining it could not happen. *Corralling many protesters into an improvised enclosure, where they may be kept for hours, is known as kettling.